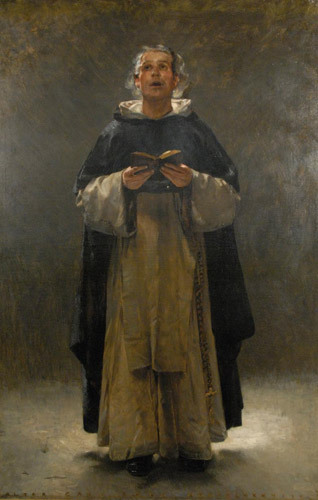 A Dominican Monk, oil on canvas, , 57" x 37" (image), 63" x 43" with frame, signed bottom, titled, and dated 1888. Walter Gay was born in Hingham, Massachusetts in January, 1857. He was the nephew of the well-known Boston painter Winkworth Allen Gay, who was instrumental in Gay’s early artistic training and who no doubt introduced the aspiring young painter to William Morris Hunt. Walter studied in Boston with Hunt between 1873 and 1876 and was directed by the older painter to study in Paris. Gay’s financial security was assured when he married heiress Matilda Travers, and the couple set out for Paris in 1876, never to return to the United States. In Paris, Gay studied for three years under Leon Bonnat, and he concentrated upon still life paintings. In Bonnat’s studio he met John Singer Sargent, with whom he would maintain a close friendship throughout his life. He also developed during these years an abiding interest in the Spanish master, Velasquez, and in the contemporary Spanish painter, Mariano Fortuny. The style of these Spanish painters remained a more pervasive influence throughout his career than either the Impressionist style which was developing in Paris upon Gay’s arrival or the Parisian Modernism which gradually replaced it. In 1882, Walter traveled to Barbizon with his uncle Winkworth and clearly fell under the influence of the famous place. From this time, scenes of peasants and workmen in rustic settings replaced still life compositions in his oeuvre. The artist exhibited widely throughout Europe, winning a gold medal at the Paris salon in 1888 and exhibiting at the World’s Columbian Exposition in Chicago in 1893. His painting Le Benedicite was purchased by the French government for the Musée du Luxembourg. Work by Walter Gay can be found in the Albright-Knox Art Gallery, the Art Institute of Chicago, the Metropolitan Museum of Art, the Museum of Fine Arts, Boston, the Pennsylvania Academy of Fine Arts, the Smithsonian American Art Museum, the Musées Nationaux Paris, the Smith College Museum of Art, and the Yale University Art Gallery, among others.